As a librarian, I could immediately appreciate the major role that the library played in the book. Seriously, people, take care of ancient tomes! 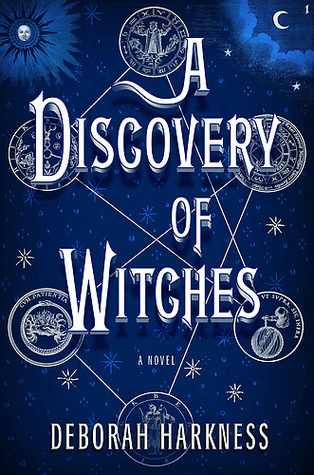 Diana Bishop is a powerful descendant of a powerful familial line of witches. After the death of her parents, she shuns the art and practice of witchcraft, though the power courses through her veins, demanding to be released. Losing herself in history and scholarly research, she lives as human a life as possible. Everything is going well, until one day the air shifts around her as she opens a long-lost and enchanted book from deep within the library. Suddenly creatures from all around are drawn to the library, and to Diana. She has unwittingly found a very powerful, very old and infinitely desired secret amongst creatures. The only person who makes sense to Diana is Matthew Clairmont, a gifted and well-respected geneticist and scholar at Oxford. He’s also the only person who SHOULDN’T make sense: he’s a vampire, and a natural enemy of witches, practicing or otherwise. Thrown in to an ever more dangerous conflict, Diana and Matthew must fight against not only other creatures but their growing attraction to one another. As more secrets come to light, the danger mounts and both will have to challenge not only societal pressures from the magical community, but their own deepest feelings and fears. This entry was posted in Books and tagged Deborah Harkness, Diana Bishop, magic, vampire, witch, Witchcraft, young adult by S.D. McPhail. Bookmark the permalink. I am eagerly waiting for Shadow of Night, due in June. This was of my favorites read all last year!